Previous Events - Friends of Little Salt Spring, Inc.
You are invited to the presentation, “The Springs of North Port Florida – History and the Future” by George “Scuba” Guy at the Friends of Little Salt Spring, Inc. at our public meeting at 7 PM on April 17th. The meeting will be in the Jockey Club Community Center located at 3050 Pan American Blvd, North Port FL. The multi media presentation will include honoring the 10 explorers and scientist whom George personally knew who dived in Warm Mineral Springs and Little Salt Spring. The people to be honored include Bill Royal, Jacques Cousteau, and Eugene “Genie” Clark – the famous “Shark Lady” who founded Mote Marine. 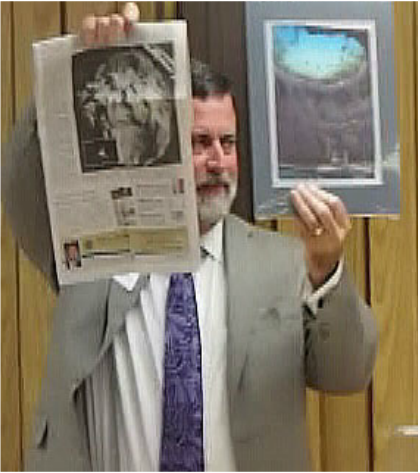 The multimedia presentation was created with the assistance of Brooks and Sean Paxton of Shark Brothers Multimedia.com. I think the presentation, which includes video clips of Eugene Clark that have not previous been seen, will be very informative and interesting. See more about George on the Board of Directors page. The Friends of Little Salt Spring had a very successful 6th Annual Little Salt Slough Clean-up! The group photo is only about half of the people who came out to help as we split up for different assignments, and I was not able to get photos of the other groups. If you were there and didn't make it into the picture; we really appreciate your participation! On February 1st the North Port City Commission presented the Friends of Little Salt Spring with a certificate declaring February 24th to be Little Salt Spring Appreciation Day, and the Sarasota County Commission followed suit. TOP LEFT: This is the capstone for the plinth that the time capsules will be entombed in. TOP RIGHT: Friends of Little Salt Springs Member Jodi Johnson is holding the piece of cable from Nick Wallenda's Grand Canyon and Niagara Falls Wire Walks donated by the Wallenda Family. 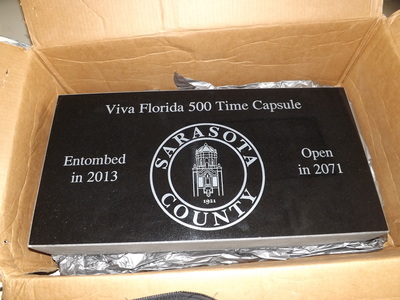 Jodi is a Sarasota County Historical Commissioner and worked tirelessly on the Time Capsule this past year along with other Historical Commissioners, representatives from Sarasota County Library Systems. BOTTOM LEFT: Lily and Bill Goetz are members of Friends of Little Salt Spring, Inc., and were both members of the Sarasota County Viva 500 Time Capsule Committee. 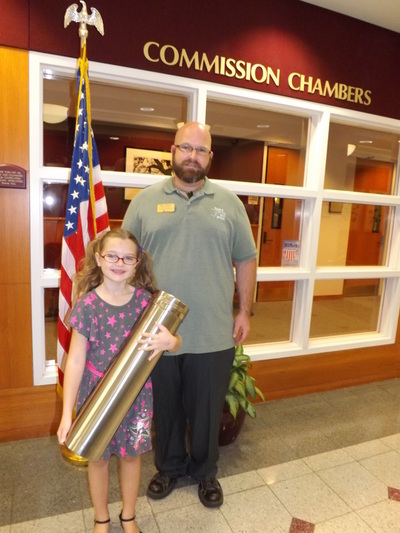 Lily is holding one of the two time capsules being entombed in a plinth located outside of the Old Osprey Schoolhouse at Historic Spanish Point. 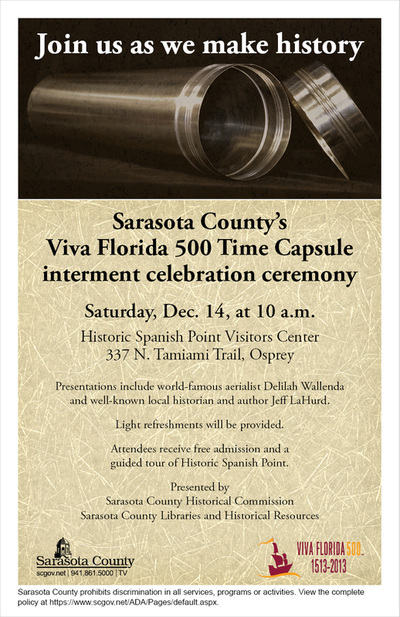 On December 14, Sarasota County's Viva Florida 500 Time Capsule will be interred during a celebratory ceremony at Historic Spanish Point. Three Friends of Little Salt Spring members (Jodi Johnson, Lily Goetz, and Bill Goetz) were on the Capsule Committee, and our youngest member, Lily Goetz, is one of the speakers, along with Nick Wallenda's mom Delilah Wallenda, and Sarasota County Commission Chair Carolyn Mason. Replicas of the two green stone pendants found at Little Salt Spring along with a visual description of them by Steve Koski (formatted and produced by our Membership Director, Janet Verdeguer), are included in the Time Capsule. Spanish Point offered will offer free admission and tours for all who attended. On November 17, 2013, the Friends of Little Salt Spring were invited by Steve Koski to walk through the County Preserve area near Little Salt Spring. During this walk it was noted that a clean-up was needed for this area. After the walk, Steve showed us some of the orchids on the Little Salt Spring property. The Ancient Waters Celebration was held January 27 at the Third annual Historic Preservation Coalition of Sarasota County social. This even twas co- hosted by Warm Mineral Springs / Little Salt Spring Archeological Society and the Friends of Little Salt Springs, Inc. 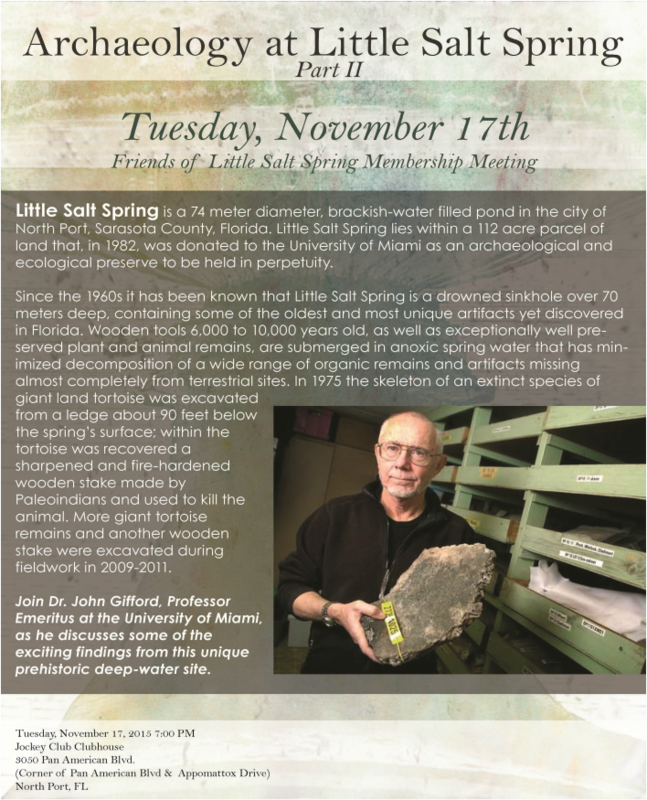 The Keynote speaker was Dr. John Gifford, University of Miami Director of Little Salt Springs, Dr. Gifford presented an outstanding overview of over twenty years of underwater research and the remarkable archeological discoveries at Little Salt Spring. Veteran archeologist, Steve Koski presented an introduction to the research and archeology of Warm Mineral Springs. 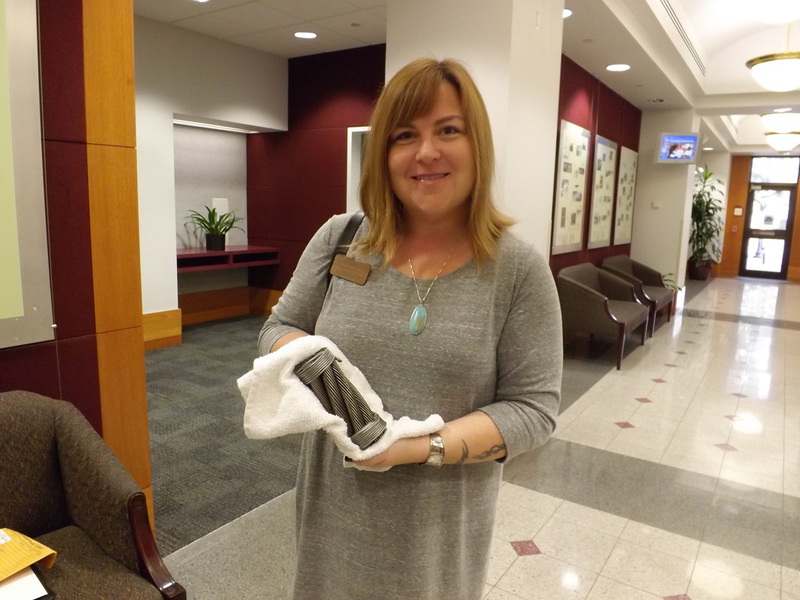 Dr. Gifford was presented a Green Stone Pendant, a replica of the one found in Little Salt Springs, that was created by Bill Goetz. On February 23, we had a two hour clean-up at the Little Salt Spring Preserve area, a future Sarasota Preserve, near Little Salt Spring. Lots of trash was removed but more work is needed. We were assisted by the Sarasota County Parks Dept and several other organizations, plus two local residents who are now members. After the clean-up, Publix graciously provided a lunch and we all enjoyed a break before we returned to our other Saturday tasks.